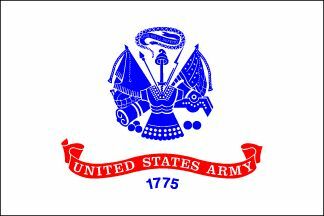 The flag of the United States Army consists of a blue replica of the official seal of the War Office. Beneath the seal is a broad scarlet scroll bearing the inscription in white letters, "United States Army". Beneath the scroll in blue Arabic numerals is "1775," the year in which the Army was created with the appointment of General George Washington as Commander-in-Chief. All of this in on a white background. The flag was officially adopted by President Dwight D. Eisenhower, on June 12, 1956.